divisibly bound up with the corruption of this world.The feast of the Dormition or Falling-asleep of the Theotokos is celebrated on the fifteenth of August, preceded by a two-week fast. This feast, which is also sometimes called the Assumption, commemorates the death, resurrection and glorification of Christ’s mother. It proclaims that Mary has been “assumed” by God into the heavenly kingdom of Christ in the fullness of her spiritual and bodily existence. Mary truly needed to be saved by Christ as all human persons are saved from the trials, sufferings and death of this world; and that having truly died, she was raised up by her Son as the Mother of Life and participates already in the eternal life of paradise which is prepared and promised to all who “hear the word of God and keep it” (Lk11.27–28). In giving birth, you preserved your virginity. In falling asleep you did not forsake the world, O Theotokos. You were translated to life, O Mother of Life, and by your prayers, you deliver our souls from death (Troparion). Neither the tomb, nor death, could hold the Theotokos, who is constant in prayer and our firm hope in her intercessions. For being the Mother of Life, she was translated to life, by the One who dwelt in her virginal womb (Kontakion). The services of the feast repeat the main theme, that the Mother of Life has “passed over into the heavenly joy, into the divine gladness and unending delight” of the Kingdom of her Son (Vesperal hymn). The Old Testament readings, as well as the gospel readings for the Vigil and the Divine Liturgy, are exactly the same as those for the feast of the Virgin’s nativity and her entrance into the Temple. Thus, at the Vigil we again hear Mary say: “My soul magnifies the Lord and my Spirit rejoices in God my Saviour” (Lk 1.47). At the Divine Liturgy we hear the letter to the Philippians where Saint Paul speaks of the self-emptying of Christ who condescends to human servitude and ignoble death in order to be “highly exalted by God his Father” (Phil 2.5–11). And once again we hear in the Gospel that Mary’s blessedness belongs to all who “hear the word of God and keep it” (Lk 11.27–28). Thus, the feast of the Dormition of the Theotokos is the celebration of the fact that all men are “highly exalted” in the blessedness of the victorious Christ, and that this high exaltation has already been accomplished in Mary the Theotokos. 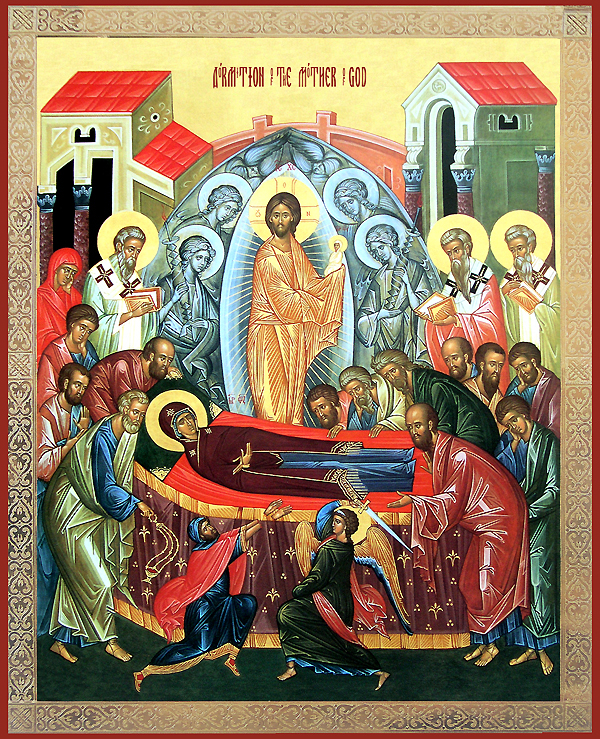 The feast of the Dormition is the sign, the guarantee, and the celebration that Mary’s fate is, the destiny of all those of “low estate” whose souls magnify the Lord, whose spirits rejoice in God the Saviour, whose lives are totally dedicated to hearing and keeping the Word of God which is given to men in Mary’s child, the Saviour and Redeemer of the world. Finally it must be stressed that, in all of the feasts of the Virgin Mother of God in the Church, the Orthodox Christians celebrate facts of their own lives in Christ and the Holy Spirit. What happens to Mary happens to all who imitate her holy life of humility, obedience, and love. With her all people will be “blessed” to be “more honorable than the cherubim and beyond compare more glorious than the seraphim” if they follow her example. All will have Christ born in them by the Holy Spirit. All will become temples of the living God. All will share in the eternal life of His Kingdom who live the life that Mary lived. In this sense everything that is praised and glorified in Mary is a sign of what is offered to all persons in the life of the Church. It is for this reason that Mary, with the divine child Jesus within her, is called in the Orthodox Tradition the Image of the Church. For the assembly of the saved is those in whom Christ dwells. This entry was posted in Events, Orthodox Catechism, Orthodox Theology, Parish Activities. Bookmark the permalink.